Mike Tidwell of the Chesapeake Climate Action Network will be giving a talk at the Maritime Museum on Tuesday, May 21st. 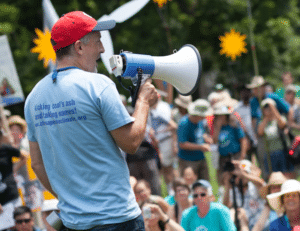 Mike is the founder and director of CCAN, a grassroots nonprofit organization dedicated to raising awareness about the impacts and solutions associated with climate change in Maryland, Virginia, and Washington, D.C. He is also an author and filmmaker who predicted in vivid detail the Hurricane Katrina disaster in his 2004 book, Bayou Farewell: The Rich Life and Tragic Death of Louisiana’s Cajun Coast. Listen to him interviewed on NPR’s Science Friday about his book here. He is also a member of the Maryland Commission on Climate Change, created by the state of Maryland in 2007, to address climate change effects on the Bay’s ecology and human health in Maryland.